True to form, I’ve left it months until my next post. Blogging’s all very well, but it’s pretty far down the list of priorities when I have a family to feed, clothe and transport around the countryside. And to be honest, there hasn’t been much on the shaping front to write about until recently. I have two boards that have been sitting in the racks waiting for finish sanding and pinlines since about October last year, while the pile of agave stems I’ve spent the last 18 months searching out and collecting have been slowly drying out and gathering dust on my shed floor. But it’s the agave where the action has, at last, been happening. I’ve started a build thread on Sanded.com.au to chart my progress as I muddle my way through this first build using this new and tricky material, but I’ll summarise the process here as well, because I really should. As I’ve detailed before, I’ve been interested for some time in trying out materials that aren’t derived entirely from petrochemicals. Agave seemed like the best option, given its relative abundance in my local area, so it’s down that route that I’ve gone. And since I decided to give it a go, I’ve been pleasantly surprised at just how much there is growing in South Australia. My guess is that pretty early on in the story of the European colonisation/invasion of this part of the world, the settlers realised that agave was the perfect plant for their gardens – it didn’t require much water and, once it was established, could be left to fend for itself while the people got on with scratching out a living in what is a harsh and unforgiving arid landscape. I’ve even gone as far as putting together a Google Earth map of all the agave sites I’ve discovered, because… well, just because. To cut a long story short, I’ve managed to collect almost a dozen agave flower stems from various sites around the state and they’ve now cured to the point where they’re ready to be made into a surfboard. After extensive research into the whats and wherefores, I’m now keen to give it a go and have taken the first tentative steps in the process. One of the major impediments was that I didn’t have access to the right tools – a large bandsaw and thicknesser – but after a random post to a Facebook surfing group a generous soul contacted me out of the blue to say he had the tools and yes, I was welcome to visit his workshop. Thanks very much shipwright and fellow board experimenter Ben Stone! Above are the results from that visit. To give the board more structural strength, I’ve decided to install a stringer using stronger timber. 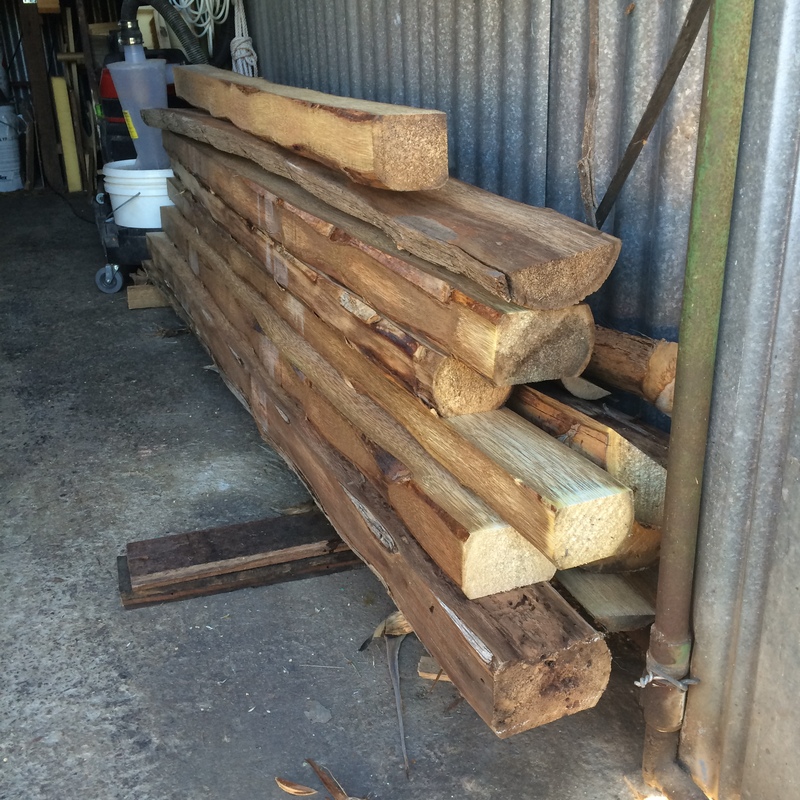 After scrounging around my local salvage yard for a bit, I was stoked to discover a couple of planks of Australian Red Cedar (Toona ciliata) that were just wide enough to accommodate my desired rocker. It’s a beautiful timber and using it is also my way of giving a nod to my roots in subtropical NSW, where the first European inhabitants were the wild, libertarian miscreants known collectively as “cedar-getters”. Red Cedar is much sought after for use in cabinetry and furniture making, but not common these days because it was so over-exploited in the 19th and early 20th centuries. This particular piece had been rescued from an old house before it was demolished and I’m excited to be giving it a new lease on life in what I hope will be a piece worthy of its heritage. After printing out my rocker template, I taped and traced it onto the cedar plank. I’ve now cut this out with a jigsaw, leaving about 3mm outside the line so allow for wonky sawmanship, which I then cleaned up using my old Stanley block plane and an even older beechwood spokeshave. In doing so, I’ve discovered that I actually love fiddling about with wood using tools as old as my dead grandfather. There’s something particularly satisfying about watching a shape you’ve previously only imagined, slowly emerging from a piece of beautiful timber. I just hope I can do it justice as the build progresses. 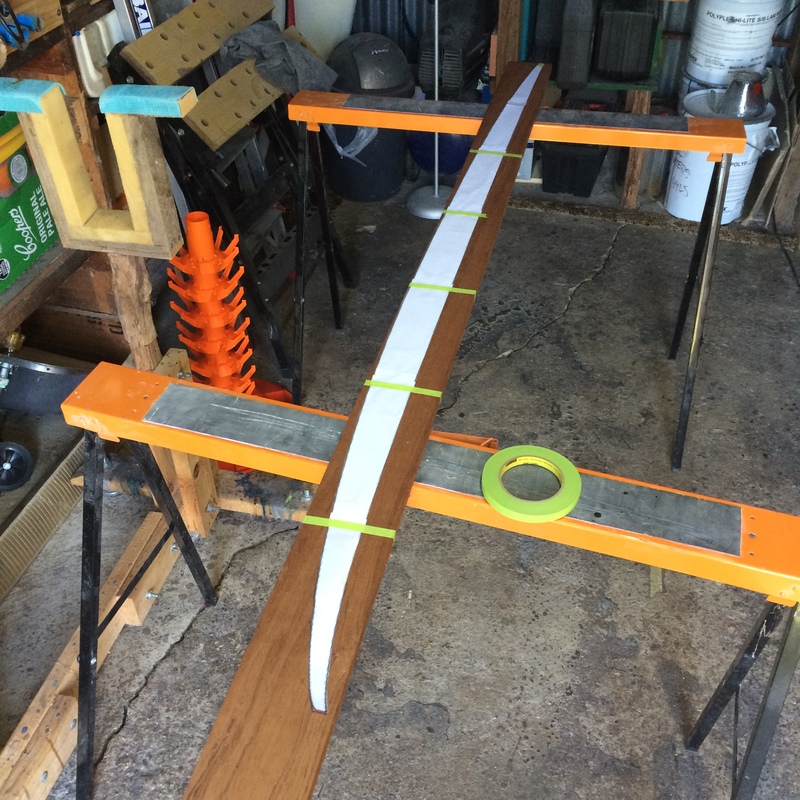 The finished board will be 5’10” x 19.5″ x 2.5″, with a wide point slightly forward of centre, a wide, rounded tail and quad fins + single box for maximum versatility. It looks a bit like the picture below, except I’ve opted for a more narrow, rounded tail to enable a tighter turning circle (or at least that’s the plan). So that’s where I’m up to now. There’s still heaps to do, but I’ve been advised to avoid working with agave in wet or humid weather because of its propensity for absorbing water and expanding. As it’s been raining here (even a bit of snow last weekend) for the past week or so, I’m putting off further work until the sun comes out again. In September most likely.